Back in the late 1940s and early 1950s, film studios and theatre owners panicked. Television was the emerging new technology and as it expanded in popularity they feared audiences would shun the theatre to stay home and watch TV instead. What could they do to beat that? They needed a competitive edge to draw audiences. Since the first television screens were the same 4 x 3 format as films at that time, their solution was to go to a wider format. That was the birth of wide screen format, at least as a concept. But, how do you make a wide screen film? The best solution would be to shoot 4-perf, 65mm format, which would mean doubling the size of the film, but that wasn't feasible because it would require all new cameras, lenses and projection equipment, and of course the cost would be huge. Another option was to just crop the 4 x 3, 4-perf negative to the desired ratio. This has been done for a number of years with Super 35mm, but in the 1950s the negative stocks and print stocks weren't up to the task. They didn't have enough resolution to fill the very large screens installed in theatres at that time. In early 1950s even local theatres had very large screens. So how to get a wide screen format -- 2.39 to 1 aspect ratio -- into a 4x3 piece of film? The solution was to maintain the vertical height and squeeze the horizontal by a factor of two. Lenses were then developed with cylindrical elements that would squeeze the horizontal plane effectively making a ratio of 8 x 3 on a 4 x 3 negative. The first commercially released film shot with a simple anamorphic lens in the new Cinemascope aspect ratio was The Robe in 1953. What does an anamorphic lens do to the picture? Depending on how the anamorphic lens is constructed, the introduction of the squeeze in acquisition may introduce assorted artifacts. The anamorphic squeeze is traditionally accomplished in front of the iris and the most prominent artifact will be the oval bokeh. Front anamorphic lenses are basically a kludge since they represent two lenses merged into one lens. On the vertical axis is a normal lens - for example, a 75mm anamorphic lens is a normal 75mm on the vertical axis - while on the horizontal axis it's a 37.5mm lens. This combination introduces two depths of field along the respective axes. In addition to two depths of field, this combination also creates the artifacts. Traditional front anamorphic lenses produce compression and edge artifacts that help make the background recede more than with a spherical lens. All these anamorphic effects and artifacts created with a front anamorphic lens contribute to what I call 'anamorphic funkiness'. 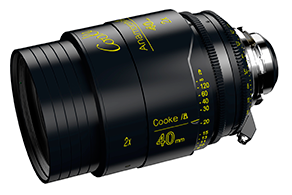 Cooke's new anamorphic lens series maintains this anamorphic character while bringing modern techniques to the lens design and manufacturing process. Why did anamorphic fall out of favour? As acquisition negative stocks and print stocks became better and better and most theatre screens became smaller and smaller, Super 35mm was a good replacement for making wide screen films. Super35mm did not incur the extra expense and hassle of shooting anamorphic that required special cameras and equipment modifications. In the digital realm, instead of having to modify cameras and work with a squeezed format until it's projected, the image can now be 'unsqueezed' right out of the camera. The camera's viewfinder no longer needs a special optic; you just flip a switch and you can view it normally. Modern video monitors all have switchable aspect ratios making viewing on the set and during production simple and no more expensive than shooting with spherical lenses. Who is using anamorphic now? In the film world, cinematographers used to have dozens of film stocks to choose from and hundreds of processing options to achieve a unique look for their films. In our digital era, these options have been reduced considerably to just four chips. With no disrespect to our camera colleagues, digital is a boring format. With fixed pixels, there is no intrinsic dynamic interest in a digital image; the image has a sterile and antiseptic quality that has today's cinematographers looking for ways to project personality and character into their films. This is one reason why there has been such an interest in old film lenses like Cooke Speed Panchros, Baltars and others. Using older glass gives a less sterile and more flattering image. It's a way of getting character into the digital image. Shooting in traditional anamorphic using new, state of the art glass and mechanics is another solution to add character and texture into an otherwise sterile format. The 'anamorphic funkiness' that traditional anamorphic lenses introduce adds character, personality and visual interest that gives the cinematographer a lot of creative freedom. Last year, Cooke announced a range of new Anamorphic/i lenses from 25mm through 135mm. They are already being used on features in the U.S. and around the world: Lazarus with Bojan Bazzeli, DP, in Budapest, in LA DP Amy Vincent is shooting Sinister 2 while Straight Outta Compton is being shot by Matthew Libatique, DP, and Antoine Roch has shot a feature film in France titled Un Homme Ideal. There are many television commercials being shot in anamorphic now as well. Two additional focal lengths, a 180mm and 300mm have just been announced, and all of the lenses should be available in 2015.